I will share a hairstyle which isn’t something that I do but I tried creating something different for the Tresemme Ramp ready Hair contest hosted by Indiblogger as my official entry for the contest. I am someone who would like to leave her hair untied and making hairstyles like updos are not preferred by me. 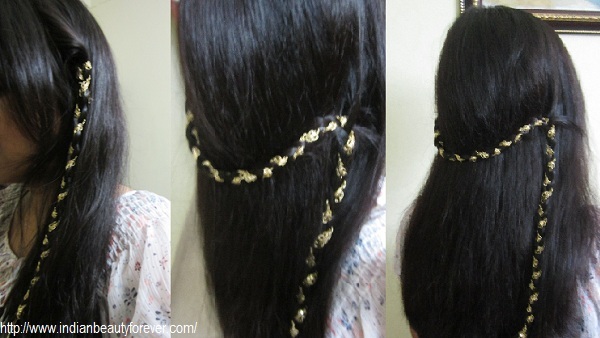 So I created this simple hairstyle with which I can also add some glam to my hair without actually tying them. For this I washed my hair with Tresemme shampoo followed by their conditioner with some hair mousee. I have used Enliven hair mousse as my hair is on the silkier side and braiding can get difficult then. To start with I took the hair from my crown area and teased them to create a bump. I took a chunk of hair just above my ear and braided it along with this golden lace with sequins. I braided it till the end and then took it on the other side near the ear, creating an arc behind the head. After that I took another chunk and braided it till the end and secured it with a hair tie, leaving it hanging. Below, you may see how I have created the hairstyle. Nice hairstyle & you have Gorgeous hairs!! That's a cute hair style. :-) nice. Very simple yet elegant. It's looking beautiful Niesha! Super imaginative.. mahnnn so pretty !! 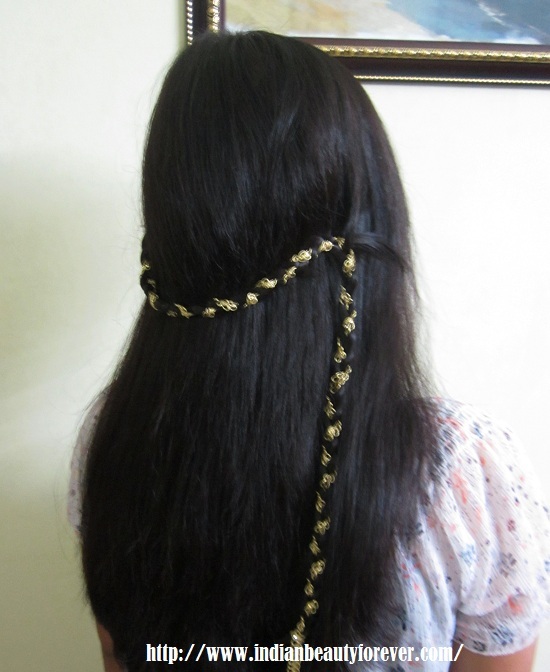 Thank you so much Rashmi :), I was not sure how it will look as I am not at all good at hairstyles.